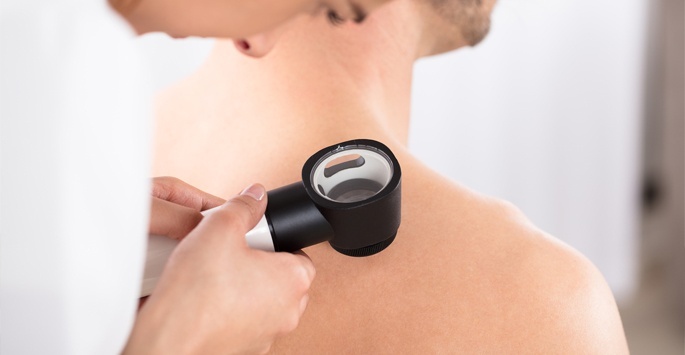 Another way to check for skin cancer is by taking a biopsy of tissues and having them examined at a laboratory. A biopsy can be done on an outpatient basis, and patients are able to return to normal activities shortly afterwards. Punch biopsy: uses a special instrument to “punch” through the skin and lift out a circular area of growth and surrounding tissue. Before taking a biopsy, a local anesthetic is administered. This allows the patient to be fully awake while not feeling any pain. Once the required tissues have been removed, the wound will be allowed to heal or sutured and then a bandage is placed. How long does it take to receive results after a skin biopsy? That depends upon the location and workload of the lab where tissues are sent. In most cases, results are obtained within one week after the procedure. What happens if a biopsy screening reveals cancer? Surgery is usually required to remove all cancerous tissue. In most cases, excision is all that is needed. What are the risks associated with skin cancer screening? Skin cancer screening may leave a visible scar. False negative and false positive tests are also possible. False negative tests can result in patients who do not receive the care they need, while false positive tests can result in unnecessary surgery along with a great deal of anxiety. Patients who notice abnormal moles or other growths should keep an eye on them to ensure they do not change over time. If this happens, the best course of action is to undergo skin cancer screening to catch this condition as early as possible. Those who suspect they may have skin cancer can take comfort in knowing that this condition is normally treated successfully when it is caught early. Patients in Jupiter, West Palm Beach, and Palm Beach County can visit Supriya Aesthetic Dermatology for more information.